Receive 3 booster packs. Featured Clans: Shadow Paladin, Nubatama, Gear Chronicle, Oracle Think Tank, Narukami, Neo Nectar, Cray Elemental. 1 pack contains 7 random cards. Includes 104 cards (2 GR, 9 RRR, 13 RR, 24 R and 56 C) + 12 SP (Parallel) + 2 SGR (Parallel) cards. 99 New cards and 5 reprints. 2 cards in every pack will definitely be R or above cards!! Revival Collection Vol. 1 Booster packs contain 3 cards each and the whole set contains 50 cards (12 RRR, 16 RR, 22 R) + 12 SP (Parallel) cards. Includes cards for Royal Paladin, Oracle Think Tank, Shadow Paladin, Gold Paladin, Genesis, Kagero, Tachikaze, Murakumo, Narukami, Nova Grappler, Dimension Police, Link Joker, Spike Brothers, Dark Irregulars, Pale Moon, Gear Chronicle, Granblue, Bermuda Triangle, Aqua Force, Megacolony, Great Nature and Neo Nectar. Also includes Beast Deity, Eradicator and Regalia cards. 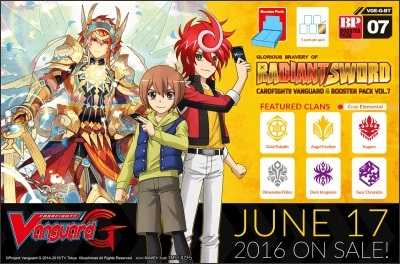 Glorious Bravery of Radiant+C166:E166 Sword features new trump cards for various characters that will play a role in time to come. Who could they be? Also being featured are cards that boost the Knight of the Sun Starter Deck. Furthermore, look out for the new Super GR parallel cards, as well as the SPs from the rare SP Clan pack! Reach out and grab hold of the glorious future! 1 pack contains 5 random cards. 104 types of cards [103 new cards / 1 reissue card] (GR: 2 / RRR: 8 / RR: 12 / R: 22 / C: 60) + SP: 12 [12 Parallel] + SGR (Super GR): 2 [2 Parallel] (+ SP: 30 [From SP Clan Pack]) 1 card in every pack will definitely be an R or above card! Includes further support for the Royal Paladin, Granblue, Shadow Paladin, Nova Grappler, Pale Moon and Neo Nectar clans, as well as Cray Elemental cards. Introduces the keywords Brave, Rush, ''Bloom''. Includes 104 cards (2 GR, 8 RRR, 12 RR, 22 R and 60 C) + 12 SP (Parallel) cards. 1 pack contains 5 random cards. 1 display contains 30 packs. 1 card in every pack will definitely be an R or above card!! There are 103 new cards and 1 reprint. The package illustration is of Shion Kiba and Transcending the Heavens, Altmile. Like the Clan Booster, the Technical Booster narrows the focus to provide more support for specific clans. However, The RECKLESS RAMPAGE focuses on not one, but THREE clans! Also, whichever clan catches your fancy, you can now build a deck solely from cards that can be found in the Technical Booster! The RECKLESS RAMPAGE includes many powerful cards that will let you launch wave after wave of overwhelming attacks! Dont forget to keep a look out for the new keyword abilities for the 3 clans of ! Plan your strategy with the new boost given to these clans by power of Stride! The set includes 75 cards [73 new + 2 reissue cards] (GR: 3 / RRR: 6 / RR: 12 / R: 21 / C: 33) + SP: 12 [12 Parallel] plus 1 PR card (number of types to be confirmed) is included in every box! Every pack will definitely have one R, and an additional R or above! 1 pack contains 7 random cards. 1 display contains 12 packs. The collaboration between Touken Ranbu -ONLINE- and Cardfight!! Vanguard makes its appearance in the English edition! Featuring the exquisite illustrations from the original game, the classical world of Touken Ranbu will be represented through the Vanguard game system. All 42 of the initial Touken Danshi are included! Let the blossoming sakura flowers take you to ancient Japan, as you rally your troops to protect history! 42 types of cards (GR: 1 / RRR: 5 / RR: 8 / R: 11 / C: 17) + SP: 5 [Parallel]. Every pack will definitely have one R, and an additional R or above! 1 pack contains 7 random cards. 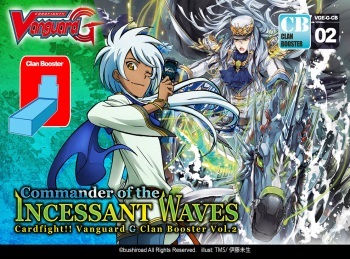 Command the stormy seas with the Clan Booster Commander of the Incessant Waves]!! This Clan Booster will feature Jaime's trump card, along with other cards with the new Wave ability Cards that power up older decks will also be included! Battle alongside with your allies and conquer the seas as well as the battle! Each pack contains 7 cards, of which 2 will definitely be R or higher! G Booster Set 4 Soul Strike Against the Supreme includes 104 cards (2 GR, 8 RRR, 12 RR, 22 R and 60 C) + 12 SP (Parallel) cards. There are 103 new cards and 1 reprint. ncludes further support for the Gear Chronicle, Royal Paladin, Neo Nectar, Shadow Paladin, Genesis, Angel Feather and Megacolony clans, as well as Cray Elemental cards. Blazing Perdition (ver.E) contains selected cards from the Japanese sets BT16 and BT17. There are a total of 144 cards to collect (10 RRR, 16 RR, 30 R and 88 C), + 14 SP (Parallel) cards + 6 LR (Legion Rare) cards. Each display will contain 1 PR card (PR/150EN Dandelion Musketeer, Mirkka). An original English Edition SP card, Lycoris Musketeer, Vera is also included in this product!! G Booster Set 3 Sovereign Star Dragon includes 104 cards (2 GR, 8 RRR, 12 RR, 22 R and 60 C) + 12 SP (Parallel) cards. Includes further support for the Link Joker, Shadow Paladin, Gold Paladin, Murakumo, Dark Irregulars and Kager? clans, as well as Cray Elemental cards. Each pack contains 5 random cards.